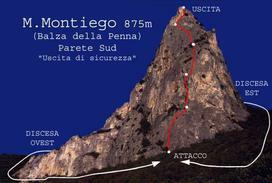 La Balza della Penna is located about 50 km from Fano and is the imposing south face of Monte Montiego (875 meters). Not far away, in front of another important mountain of the Marche Apennines, Monte Nerone (1,525 meters). Among all the "alpine" routes of the Marche Apennines it is certainly one of the most beautiful. From Fano take the SS 3 towards Rome. At the junction of Acqualagna you exit going towards Piobbico. After about 8 km, just before a quarry, exactly at km 40,800, you park your car in a pitch on the left side of the road, before a bridge. 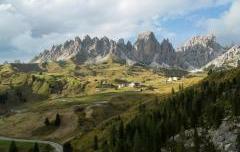 At the top right, visible from the road, the beautiful silhouette of the Balza della Penna. Just before the guardrail you take a path that, with wide turns, climbs into the woods. Once you reach an area with scarce vegetation, climb up, on a more steep terrain, for evident traces towards the base of the wall. The attack is located below the vertical of the summit, hidden by vegetation. 30 minutes. The street is fully equipped. In any case it is a climb and a stud of a mountaineering mold. Adjust accordingly. It is advisable to have the helmet, the brackets and two half-ropes of 50 meters for a possible rappelling along the way or possible retreat! Three possibilities. 1. Rappelling along the way. Advisable only if you avoid the exit at the top. Attention, two 50-meter strings are required! 2. From the anticima you follow in a north / west direction, the easy but treacherous crest of broken rock, sometimes very sharp, for a hundred meters, red marks, until you reach the top proper. We continue on a ridge, now very wide, and we reach a large depression. Bending to the left, go up a hill where there is a small tree / shrub on the bottom left, not easy to spot, with lanyards and ring. You go down with two 50 and 25 meters double on the west side, along a nice dihedral with the possibility of breaking the first drop. At this point we descend through gravel along a steep channel in a southerly direction. As soon as possible (be careful not to get off too much!) You leave it and oblique to the left, (face downstream), in the middle of the vegetation, until you reach the path that goes to the base of the imposing south wall of the Balza della Penna. to arrive just below the attack of the street. 1.30 am 3. Once arrived at the large depression, continue along the ridge, in a northerly direction, until the east side of the ridge, from rocky and vertical, becomes wooded and slopes on an evident clearing, which crosses in an easterly direction, until its term. Now for traces of trail descend, in the middle of the forest, in the direction of the attack of the road, trying to stay away from the east wall to avoid some rock jumps. Descent advisable because faster and does not require double strings. 50 minutes. The path is very evident if you look and memorize from the top, before starting the descent. 3 L3 55 m Traversare a destra per alcuni metri fino a raggiungere un diedro, non visibile dalla sosta. Salire ora il bellissimo diedro fessurato fino a quando questo si apre a parete. Ora le difficoltà si attenuano e senza via obbligata, cercando di stare al centro dove la roccia è migliore, guadagnare la comoda sosta sotto la stupenda parete di roccia grigia, parte terminale della salita. Allungare le protezioni nel traverso per evitare fastidiosi attriti della corda! Alcuni chiodi in via. Sosta con catena ed anello di calata. 4 L4 45 m Salire la bellissima parete sovrastante seguendo un sistema di fessure e chiodi fin sotto uno strapiombo. Superarlo e poco sopra, all'altezza di uno spit, salire con stupenda arrampicata in obliquo a sinistra, seguendo una linea molto logica che conduce in alto a sinistra, sul filo dello spigolo, dove si trova la sosta. Diversi chiodi in via. Sosta su spit e chiodo. 5 L5 45 m Seguire ora lo spigolo, all'inizio appoggiato, per una ventina di metri, sotto un'incombente parete gialla, e raggiungere un comodo terrazzino con alberello dove si trova una sosta con catena ed anello di calata. A questo punto si può interrompere la salita, evitando la cima, e, con quattro calate da 50 metri, scendere nuovamente alla base della via. Consigliabile proseguire per il sovrastante bel diedro fessurato, all'inizio strapiombante, di roccia gialla, solo apparentemente poco buona, e raggiungere così l'anticima della Balza della Penna. Utili uno o due friend medi per proteggere il diedro poco chiodato! Ometto di vetta. Alcuni chiodi in via. Sosta su fix con cordone, non facile da trovare!